The course was redesigned by Jon Morrow and Turf Pro Golf’s Craig Bertram about four years ago, keeping the original routing, enhanced by Bertram’s re-shaping of the green complexes. Lotus Valley re-opened to rave reviews and has gained in popularity for those wanting to take the journey from Bangkok to the resort. The golf course continues to mature, offers a memorable challenge and is in great shape. The complementary countryside atmosphere adds to the pleasure of playing here. The club house and facilities are first class and the golf course is very playable for golfers of all skill levels. This is a good addition to an extended golf holiday in Thailand. Lotus Valley’s creative layout is a perfect balance of long established golf challenge, modern golf course preparation and quality maintenance. 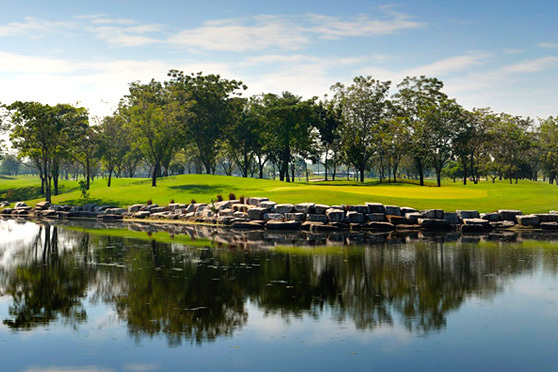 Lotus Valley offers all golfers the chance to experience all that is celebrated about luxury boutique golf.